Not to be confused with automation as a process. This article is about a self-operating machine. For other uses, see Automaton (disambiguation). For Automata, see Automata (disambiguation). An automaton (/ɔːˈtɒmətən/; plural: automata or automatons) is a self-operating machine, or a machine or control mechanism designed to automatically follow a predetermined sequence of operations, or respond to predetermined instructions. Some automata, such as bellstrikers in mechanical clocks, are designed to give the illusion to the casual observer that they are operating under their own power. The word "automaton" is the latinization of the Greek αὐτόματον, automaton, (neuter) "acting of one's own will". This word was first used by Homer to describe automatic door opening, or automatic movement of wheeled tripods. It is more often used to describe non-electronic moving machines, especially those that have been made to resemble human or animal actions, such as the jacks on old public striking clocks, or the cuckoo and any other animated figures on a cuckoo clock. There are many examples of automata in Greek mythology: Hephaestus created automata for his workshop; Talos was an artificial man of bronze; Daedalus used quicksilver to install voice in his moving statues; King Alkinous of the Phaiakians employed gold and silver watchdogs. The automata in the Hellenistic world were intended as tools, toys, religious idols, or prototypes for demonstrating basic scientific principles. Numerous water powered automata were built by Ktesibios, a Greek inventor and the first head of the Great Library of Alexandria, for example he "used water to sound a whistle and make a model owl move. He had invented the world's first "cuckoo" clock". 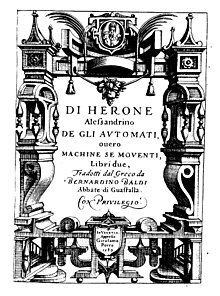 This tradition continued in Alexandria with inventors such as the Greek mathematician Hero of Alexandria (sometimes known as Heron), whose writings on hydraulics, pneumatics, and mechanics described siphons, a fire engine, a water organ, the aeolipile, and a programmable cart. The Antikythera mechanism from 150–100 BC was designed to calculate the positions of astronomical objects. However, the information gleaned from recent scans of the fragments indicate that it may have come from the colonies of Corinth in Sicily and implies a connection with Archimedes. According to Jewish legend, Solomon used his wisdom to design a throne with mechanical animals which hailed him as king when he ascended it; upon sitting down an eagle would place a crown upon his head, and a dove would bring him a Torah scroll. It's also said that when King Solomon stepped upon the throne, a mechanism was set in motion. As soon as he stepped upon the first step, a golden ox and a golden lion each stretched out one foot to support him and help him rise to the next step. On each side, the animals helped the King up until he was comfortably seated upon the throne. The king stared at the figure in astonishment. It walked with rapid strides, moving its head up and down, so that anyone would have taken it for a live human being. The artificer touched its chin, and it began singing, perfectly in tune. He touched its hand, and it began posturing, keeping perfect time...As the performance was drawing to an end, the robot winked its eye and made advances to the ladies in attendance, whereupon the king became incensed and would have had Yen Shih [Yan Shi] executed on the spot had not the latter, in mortal fear, instantly taken the robot to pieces to let him see what it really was. And, indeed, it turned out to be only a construction of leather, wood, glue and lacquer, variously coloured white, black, red and blue. Examining it closely, the king found all the internal organs complete—liver, gall, heart, lungs, spleen, kidneys, stomach and intestines; and over these again, muscles, bones and limbs with their joints, skin, teeth and hair, all of them artificial...The king tried the effect of taking away the heart, and found that the mouth could no longer speak; he took away the liver and the eyes could no longer see; he took away the kidneys and the legs lost their power of locomotion. The king was delighted. Other notable examples of automata include Archytas's dove, mentioned by Aulus Gellius. Similar Chinese accounts of flying automata are written of the 5th century BC Mohist philosopher Mozi and his contemporary Lu Ban, who made artificial wooden birds (ma yuan) that could successfully fly according to the Han Fei Zi and other texts. "lions, made either of bronze or wood covered with gold, which struck the ground with their tails and roared with open mouth and quivering tongue," "a tree of gilded bronze, its branches filled with birds, likewise made of bronze gilded over, and these emitted cries appropriate to their species" and "the emperor's throne" itself, which "was made in such a cunning manner that at one moment it was down on the ground, while at another it rose higher and was to be seen up in the air." Similar automata in the throne room (singing birds, roaring and moving lions) were described by Luitprand's contemporary, the Byzantine emperor Constantine Porphyrogenitus, in his book Περὶ τῆς Βασιλείου Τάξεως. In the mid-8th century, the first wind powered automata were built: "statues that turned with the wind over the domes of the four gates and the palace complex of the Round City of Baghdad". The "public spectacle of wind-powered statues had its private counterpart in the 'Abbasid palaces where automata of various types were predominantly displayed." Also in the 8th century, the Muslim alchemist, Jābir ibn Hayyān (Geber), included recipes for constructing artificial snakes, scorpions, and humans that would be subject to their creator's control in his coded Book of Stones. In 827, Abbasid caliph al-Ma'mun had a silver and golden tree in his palace in Baghdad, which had the features of an automatic machine. There were metal birds that sang automatically on the swinging branches of this tree built by Muslim inventors and engineers. [page needed] The Abbasid caliph al-Muqtadir also had a golden tree in his palace in Baghdad in 915, with birds on it flapping their wings and singing. In the 9th century, the Banū Mūsā brothers invented a programmable automatic flute player and which they described in their Book of Ingenious Devices. Automaton in the Swiss Museum CIMA. An automaton writing a letter in Swiss Museum CIMA. Al-Jazari described complex programmable humanoid automata amongst other machines he designed and constructed in the Book of Knowledge of Ingenious Mechanical Devices in 1206. His automaton was a boat with four automatic musicians that floated on a lake to entertain guests at royal drinking parties. His mechanism had a programmable drum machine with pegs (cams) that bump into little levers that operate the percussion. The drummer could be made to play different rhythms and drum patterns if the pegs were moved around. According to Charles B. Fowler, the automata were a "robot band" which performed "more than fifty facial and body actions during each musical selection." Al-Jazari constructed a hand washing automaton first employing the flush mechanism now used in modern toilets. It features a female automaton standing by a basin filled with water. When the user pulls the lever, the water drains and the automaton refills the basin. His "peacock fountain" was another more sophisticated hand washing device featuring humanoid automata as servants who offer soap and towels. Mark E. Rosheim describes it as follows: "Pulling a plug on the peacock's tail releases water out of the beak; as the dirty water from the basin fills the hollow base a float rises and actuates a linkage which makes a servant figure appear from behind a door under the peacock and offer soap. When more water is used, a second float at a higher level trips and causes the appearance of a second servant figure — with a towel!" Al-Jazari thus appears to have been the first inventor to display an interest in creating human-like machines for practical purposes such as manipulating the environment for human comfort. Samarangana Sutradhara, a Sanskrit treatise by Bhoja (11th century), includes a chapter about the construction of mechanical contrivances (automata), including mechanical bees and birds, fountains shaped like humans and animals, and male and female dolls that refilled oil lamps, danced, played instruments, and re-enacted scenes from Hindu mythology. Villard de Honnecourt, in his 1230s sketchbook, show plans for animal automata and an angel that perpetually turns to face the sun. At the end of the thirteenth century, Robert II, Count of Artois built a pleasure garden at his castle at Hesdin that incorporated several automata as entertainment in the walled park. The work was conducted by local workmen and overseen by the Italian knight Renaud Coignet. It included monkey marionettes, a sundial supported by lions and "wild men", mechanized birds, mechanized fountains and a bellows-operated organ. The park was famed for its automata well into the fifteenth century before it was destroyed by English soldiers in the sixteenth. The Chinese author Xiao Xun wrote that when the Ming Dynasty founder Hongwu (r. 1368–1398) was destroying the palaces of Khanbaliq belonging to the previous Yuan Dynasty, there were—among many other mechanical devices—automata found that were in the shape of tigers. A cuckoo clock with a built in automaton of a cuckoo that flaps its wings and opens its beak in time to the sounds of the cuckoo call to mark the number of hours on the analogue dial. The Renaissance witnessed a considerable revival of interest in automata. Hero's treatises were edited and translated into Latin and Italian. Giovanni Fontana created mechanical devils and rocket-propelled animal automata. Numerous clockwork automata were manufactured in the 16th century, principally by the goldsmiths of the Free Imperial Cities of central Europe. These wondrous devices found a home in the cabinet of curiosities or Wunderkammern of the princely courts of Europe. Hydraulic and pneumatic automata, similar to those described by Hero, were created for garden grottoes. Leonardo da Vinci sketched a more complex automaton around the year 1495. The design of Leonardo's robot was not rediscovered until the 1950s. The robot could, if built successfully, move its arms, twist its head, and sit up. The Smithsonian Institution has in its collection a clockwork monk, about 15 in (380 mm) high, possibly dating as early as 1560. The monk is driven by a key-wound spring and walks the path of a square, striking his chest with his right arm, while raising and lowering a small wooden cross and rosary in his left hand, turning and nodding his head, rolling his eyes, and mouthing silent obsequies. From time to time, he brings the cross to his lips and kisses it. It is believed that the monk was manufactured by Juanelo Turriano, mechanician to the Holy Roman Emperor Charles V.
A new attitude towards automata is to be found in Descartes when he suggested that the bodies of animals are nothing more than complex machines - the bones, muscles and organs could be replaced with cogs, pistons and cams. Thus mechanism became the standard to which Nature and the organism was compared. France in the 17th century was the birthplace of those ingenious mechanical toys that were to become prototypes for the engines of the Industrial Revolution. Thus, in 1649, when Louis XIV was still a child, an artisan named Camus designed for him a miniature coach, and horses complete with footmen, page and a lady within the coach; all these figures exhibited a perfect movement. According to P. Labat, General de Gennes constructed, in 1688, in addition to machines for gunnery and navigation, a peacock that walked and ate. Athanasius Kircher produced many automata to create Jesuit shows, including a statue which spoke and listened via a speaking tube. A Japanese automata theater in Osaka, drawn in 18th century. The Takeda family opened their automata theater in 1662. The world's first successfully-built biomechanical automaton is considered to be The Flute Player, invented by the French engineer Jacques de Vaucanson in 1737. He also constructed the Digesting Duck, a mechanical duck that gave the false illusion of eating and defecating, seeming to endorse Cartesian ideas that animals are no more than machines of flesh. In 1769, a chess-playing machine called the Turk, created by Wolfgang von Kempelen, made the rounds of the courts of Europe purporting to be an automaton. The Turk was operated from inside by a hidden human director, and was not a true automaton. Other 18th century automaton makers include the prolific Swiss Pierre Jaquet-Droz (see Jaquet-Droz automata) and his contemporary Henri Maillardet. Maillardet, a Swiss mechanic, created an automaton capable of drawing four pictures and writing three poems. Maillardet's Automaton is now part of the collections at the Franklin Institute Science Museum in Philadelphia. Belgian-born John Joseph Merlin created the mechanism of the Silver Swan automaton, now at Bowes Museum. 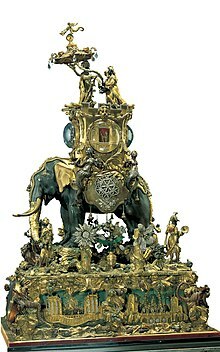 A musical elephant made by the French clockmaker Hubert Martinet in 1774 is one of the highlights of Waddesdon Manor. Tipu's Tiger is another late-18th century example of automata, made for Tipu Sultan, featuring a European soldier being mauled by a tiger. According to philosopher Michel Foucault, Frederick the Great, king of Prussia from 1740 to 1786, was "obsessed" with automata. According to Manuel de Landa, "he put together his armies as a well-oiled clockwork mechanism whose components were robot-like warriors". Japan adopted automata during the Edo period (1603–1867); they were known as karakuri ningyō. Automata, particularly watches and clocks, were popular in China during the 18th and 19th centuries, and items were produced for the Chinese market. Strong interest by Chinese collectors in the 21st century brought many interesting items to market where they have had dramatic realizations. A singing bird box made about 1890 by Bontems. Bird dressed with iridescent hummingbird feathers and case made of tortoiseshell. The famous magician Jean Eugène Robert-Houdin (1805–1871) was known for creating automata for his stage shows. In 1840, Italian inventor Innocenzo Manzetti constructed a flute-playing automaton, in the shape of a man, life-size, seated on a chair. Hidden inside the chair were levers, connecting rods and compressed air tubes, which made the automaton's lips and fingers move on the flute according to a program recorded on a cylinder similar to those used in player pianos. The automaton was powered by clockwork and could perform 12 different arias. As part of the performance it would rise from the chair, bow its head, and roll its eyes. Tea-serving Japanese automaton, "karakuri ningyō", with mechanism (right), 19th century. The period 1860 to 1910 is known as "The Golden Age of Automata". During this period many small family based companies of Automata makers thrived in Paris. From their workshops they exported thousands of clockwork automata and mechanical singing birds around the world. It is these French automata that are collected today, although now rare and expensive they attract collectors worldwide. The main French makers were Bontems, Lambert, Phalibois, Renou, Roullet & Decamps, Theroude and Vichy. Contemporary automata continue this tradition with an emphasis on art, rather than technological sophistication. Contemporary automata are represented by the works of Cabaret Mechanical Theatre in the United Kingdom, Dug North and Chomick+Meder, Thomas Kuntz, Arthur Ganson, Joe Jones in the United States, Le Défenseur du Temps by French artist Jacques Monestier, and François Junod in Switzerland. Some mechanized toys developed during the 18th and 19th centuries were automata made with paper. Despite the relative simplicity of the material, paper automata require a high degree of technical ingenuity. One of the most advanced automata proposed to date is NASA's Automaton Rover for Extreme Environments (AREE), a wind-powered automaton to be used for exploring Venus. Unlike other modern automata, AREE is an automaton instead of a robot for practical reasons — Venus's harsh conditions, particularly its surface temperature of 462 °C (864 °F), make operating electronics there impossible. The potential educational value of mechanical toys in teaching transversal skills has been recognised by the European Union education project Clockwork objects, enhanced learning: Automata Toys Construction (CLOHE). Examples of automaton clocks include Chariot clock and Cuckoo Clocks. The Cuckooland Museum exhibits autonomous clocks. Bailly, Christian (2003). Automata: The Golden Age: 1848-1914. London: Robert Hale. ISBN 9780709074038. Beyer, Annette (1983). Faszinierende Welt der Automaten : Uhren, Puppen, Spielereien (1st ed.). München: Callwey. ISBN 9783766706591. Bowers, Q. David (1974). Encyclopedia of Automatic Musical Instruments (4. printing ed.). Vestal, NY: Vestal Press. ISBN 9780911572087. Brauers, Jan (1984). Von der Äolsharfe zum Digitalspieler: 2000 Jahre mechanische Musik, 100 Jahre Schallplatte. München: Klinkhardt & Biermann. ISBN 9783781402393. Chapuis, Alfred; Gélis, Edouard (1928). Le monde des automates; étude historique et technique. OCLC 3006589. Critchley, Macdonald; Henson, R. A. (1978). Music and the brain. Studies in the neurology of music. London: Heinemann. ISBN 9780433067030. Waard, R. D. (1967). From music boxes to street organs. OCLC 609338403. Chapuis, Alfred; Droz, Edmond (1956). The Jaquet-Droz mechanical puppets. Neuchatel: Historical Museum. OCLC 315497609. Hyman, Wendy Beth (2011). The Automaton in English Renaissance Literature. Farnham, Surrey: Ashgate. ISBN 0-7546-6865-7. Cardinal, Catherine; Mercier, François (1993). Museums of horology La Chaux-de-Fonds, Le Locle. Geneva: Banque Paribas. ISBN 9783908184348. Montiel, Luis (30 June 2013). "Proles sine matre creata: The Promethean Urge in the History of the Human Body in the West". Asclepio. 65 (1). doi:10.3989/asclepio.2013.01. Lapaire, Claude (1992). Clock and Watch Museum, Geneva. Geneva: Art and History Museum. ISBN 9782830600728. Ord-Hume, Arthur W. J. G. (1973). Clockwork music: an illustrated history of mechanical musical instruments from the music box to the pianola, from automation lady virginal players to orchestrion. New York: Crown Publishers. ISBN 9780517500002. Ord-Hume, Arthur W.J.G. (1978). Barrel organ: the story of the mechanical organ and its repair. South Brunswick, N.J.: A.S. Barnes. ISBN 9780498014826. Rausser, Fernand; Bonhôte, Daniel; Baud, Frédy (1972). All'Epoca delle Scatole Musicali, Edizioni Mondo, 175 pp. Carrera, Roland; Loiseau, Dominique; Roux, Olivier; Luder, Jean Jacques (1979). Androids: The Jaquet-Droz Automatons. Lausanne: Scriptar. ISBN 9782880120184. Troquet, Daniel (1989). The wonderland of music boxes and automata. Sainte-Croix. OCLC 27888631. Webb, Graham (1984). The musical box handbook (2nd ed.). Vestal, NY: Vestal Press. ISBN 9780911572360. Weiss-Stauffacher, Heinrich; Bruhin, Rudolf (1976). The marvelous world of music machines. Tokyo: Kodansha International. ISBN 9780870112584. Winter-Jensen, Anne (1987). Automates & musiques: pendules. Genève: Musée de l'horlogerie et de l'émaillerie. ISBN 9782830600476. Wosk, Julie (2015). My Fair Ladies: Female Robots, Androids, and Other Artificial Eves. ISBN 9780813563374. ^ The automatones of Greek Mythology online at the Theoi Project. ^ This "first cuckoo clock" was further stated and described in the 2007 book The Rise and Fall of Alexandria: Birthplace of the Modern World by Justin Pollard and Howard Reid on page 132: "Soon Ctesibius's clocks were smothered in stopcocks and valves, controlling a host of devices from bells to puppets to mechanical doves that sang to mark the passing of each hour - the very first cuckoo clock!" ^ Brett, Gerard (July 1954), "The Automata in the Byzantine "Throne of Solomon"", Speculum, 29 (3): 477–487, doi:10.2307/2846790, ISSN 0038-7134, JSTOR 2846790. ^ Harry Henderson (1 January 2009). Encyclopedia of Computer Science and Technology. Infobase Publishing. p. 13. ISBN 978-1-4381-1003-5. Retrieved 28 May 2013. 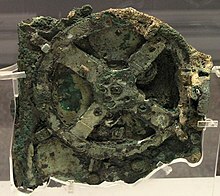 The earliest known analog computing device is the Antikythera mechanism. ^ "King Solomon's Throne". www.chabad.org. ^ Needham, Volume 2, 53. ^ Needham, Volume 2, 54. ^ Safran, Linda (1998). Heaven on Earth: Art and the Church in Byzantium. Pittsburgh: Penn State Press. p. 30. ISBN 0-271-01670-1. Records Liutprand's description. ^ Ismail b. Ali Ebu'l Feda history, Weltgeschichte, hrsg. von Fleischer and Reiske 1789-94, 1831. ^ A. Marigny (1760). Histoire de Arabes. Paris, Bd. 3, S.206. ^ "A 13th Century Programmable Robot". shef.ac.uk. University of Sheffield. Archived from the original on June 29, 2007. ^ Varadpande, Manohar Laxman (1987). History of Indian Theatre, Volume 1. p. 68. ^ Wujastyk, Dominik (2003). The Roots of Ayurveda: Selections from Sanskrit Medical Writings. p. 222. ^ Needham, Joseph (1965). Science and Civilisation in China: Volume 4, Physics and Physical Technology Part 2, Mechanical Engineering. p. 164. ^ Landsberg, Sylvia (1995). The Medieval Garden. New York: Thames and Hudson. p. 22. ^ Macdougall, Elisabeth B. Medieval Gardens. Google Books. Retrieved 19 July 2012. ^ Needham, Volume 4, Part 2, 133 & 508. ^ Schultz, P.D., & Schultz, S.E. (2008). A History of Modern Psychology.(pp. 28-34).Thompson Wadsworth. ^ "The Bowes Museum > Collections > Explore The Collection > The Silver Swan". www.thebowesmuseum.org.uk. ^ Waddesdon Manor (22 July 2015). "A Marvellous Elephant - Waddesdon Manor" – via YouTube. ^ See Michel Foucault, Discipline and Punish, New York, Vintage Books, 1979, p.136: "The classical age discovered the body as object and target of power... The great book of Man-the-Machine was written simultaneously on two registers: the anatomico-metaphysical register, of which Descartes wrote the first pages and which the physicians and philosophers continued, and the technico-political register, which was constituted by a whole set of regulations and by empirical and calculated methods relating to the army, the school and the hospital, for controlling or correcting the operations of the body. These two registers are quite distinct, since it was a question, on one hand, of submission and use and, on the other, of functioning and explanation: there was a useful body and an intelligible body... The celebrated automata [of the 18th century] were not only a way of illustrating an organism, they were also political puppets, small-scale models of power: Frederick, the meticulous king of small machines, well-trained regiments and long exercises, was obsessed with them." ^ Kolesnikov-Jessop, Sonia (November 25, 2011). "Chinese Swept Up in Mechanical Mania". The New York Times. Retrieved November 25, 2011. Mechanical curiosities were all the rage in China during the 18th and 19th centuries, as the Qing emperors developed a passion for automaton clocks and pocket watches, and the "Sing Song Merchants", as European watchmakers were called, were more than happy to encourage that interest. ^ "Chomick+Meder – Figurative Art and Automata". www.chomickmeder.com. ^ "Artomic Automata". artomic.com. Archived from the original on 2010-03-05. Retrieved 2008-04-25. Was this automaton the world's first computer? Incredible mechanical boy built 240 years ago who could actually write Daily Mail, November 6, 2013, "The Writer" created by watchmaker Pierre Jaquet-Droz in the 1770s. Large color photos.